Cancer is one of the zodiac constellations, found near the other constellations of Gemini, Lynx, Leo Minor, Hydra, and Canis Minor. The constellation is a medium sized constellation that covers approximately 506 square degrees of sky, and its brightest star has a magnitude of about 3.5. Two of its stars have known planets orbiting them, with the stars including four gas giants and one supergiant. Cancer requires fairly dark skies to see it, as under the lights of a typical city it is invisible. Cancer is named after the Latin word for crab, and it is represented by a crab in the zodiac. The constellation lies between Gemini, the twins and Leo, the lion. 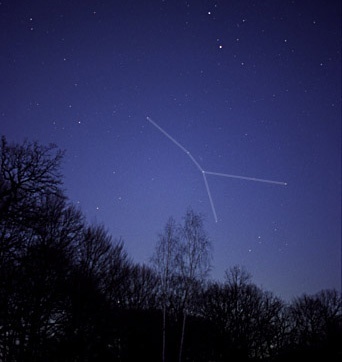 When looking at the constellation with the naked eye it appears as an upside-down Y. Cancer can be seen in the early spring in the northern hemisphere, and in the autumn in the southern hemisphere. The right ascension of cancer is nine hours, and it has a declination of 20°. It is best seen between latitudes of -60° and 90°, and its peak visibility is at 9 PM during the month of March in the northern hemisphere. The constellation is home to two different Messier objects, astronomical objects initially discovered by the French astronomer Charles Messier. One of the Messier objects in the constellation is Messier 44. Messier 44 is also referred to as the beehive cluster, owing to the fact that the cluster has an appearance similar to a bee swarm. This cluster of stars contains about 50 stars total. The other Messier object in the constellation is 67, which is another cluster of stars. In terms of the constellation’s notable single stars, the brightest star in the constellation is β Cnc, which has a magnitude of approximately 3.5. There’s also the star known as α Cnc (Acubens), “the claw” and it has a magnitude of about 3.0. The other notable stars within the constellation are the δ Cnc (Asellus Australis), or the southern donkey and the γ Cnc (Asellus Borealis) or the northern donkey. The consolation of Cancer has several exoplanets found in it, with the most notable exoplanet being 55 Cancri e. 55 Cancri e was once called a “diamond world”, though it is no longer referred to as such. Observations of the exoplanet originally taken in 2010 suggested that the star the planet revolves around possessed more carbon than oxygen within the interior of the star. During 2012 another study examined the radius and mass of the exoplanet and based on the star’s composition it was hypothesized that the planet possessed a massive graphite surface fitted over a substantial layer of diamond. However, a study done in 2013 found that the amount of carbon on the planet may be far less than the amount which was first estimated, so the planet may not be a “diamond” planet after all. The planet’s host star is now thought to have about 25% more oxygen than the original estimate. The Spitzer space telescope has monitored heat emissions from 55 Cancri e, and results obtained in 2013 revealed that the planet is possibly very moist and warm. How warm? Research done in 2016 implies that the planet could be extremely hot and that the surface of the planet could be covered in flowing lava. The daytime temperatures on the planet could be as high as 4000°F or about 2400°C, and about half of that temperature during the nighttime. The most notable stars in the constellation of Cancer are the brightest star in the constellation – β Cnc, α Cnc (Acubens) – “the claw”, the δ Cnc (Asellus Australis), or the southern donkey and the γ Cnc (Asellus Borealis) and the northern donkey, and ι Cnc A. Beta Cancri is also referred to as Tarf, and it is the constellation of Cancer’s brightest star. The apparent visual magnitude of the star is about 3.5. Parallax measurements of the star system reveal that it is around 290 ly from our sun. Beta Cancri b is an exoplanet believed to be in orbit around Beta Cancri. The name Tarf is derived from an Arabic word meaning “age” or “end”. The star is a K type orange giant, and the radius of it is about 50 times the radius of the sun. The star is quite abundant in the element barium, and it gives off an orange light. The surface temperature of the star is estimated to be around 3990° Kelvin. Beta Cancri b was discovered orbiting the star in 2014, and the planet is believed to have a minimum mass of around eight times that of Jupiter, orbiting Beta Cancri every 605 days. Alpha Cancri is also referred to as Acubens, Acubens comes from an Arabic word meaning “the claw”. Acubens is a star system, and the primary component has a magnitude of around 4.20, and as such, it is a rather dim star, just barely visible to the naked eye. However, in terms of its luminosity, it is approximately 23 times more luminous than our Sun. The star system is thought to be approximately one hundred and 64 light years away from Earth, and because it is near the ecliptic, it is frequently occulted by our moon. α Cancri A is the primary component of the system, and it has a companion, α Cancri B. α Cancri B has a magnitude of about 11. There is some evidence that suggests α Cancri A is actually a binary star. Delta Cancri is a double star, within the constellation of cancer. Combined, these two stars are the second brightest star system in the constellation, and they are about 180 ly from the sun. The two constituent parts of the star system are Delta Cancri A and B. The entire star system used to bear the name Asellus Australis, or “southern donkey colt” in Latin. This name now refers to only the star Delta Cancri Aa, as a result of the International Astronomical Union deciding in 2016 that proper names should only be given to individual stars instead of entire star systems. Much like Alpha Cancri, the star is just slightly north of the ecliptic, and as a result, it is occasionally occulted by the moon. Gamma Cancri has multiple stars within it. It is considered a spectroscopic binary star, with the p[rimary star being Gamma Cancri A and its companion star being Gamma Cancri B. Gamma Cancri was once referred to as Asellus Borealis, “northern donkey colt” in Latin. However, new standards created by the International Astronomical Union mandates that individual stars are given names, instead of star systems, so Asellus Borealis now only refers to Gamma Canci Aa. The Gamma Cancri A star has a magnitude of around 4.67, and it’s an A-type subgiant that gives off white light. The surface temperature of the star is about 9108° K and it has a luminosity about 36 times greater than the luminosity of our sun. It is also about 181 ly from our sun. Iota Cancri is found at the top of the upside down “Y”. Iota Cancri is a double star, and it is comprised of ι Cancri and ι Cancri A. ι Cancri A is the brighter star, and it has an apparent magnitude of about 4.0. ι Cancri A is a barium star. ι Cancri B is the fainter out of the two stars. The second star is an A-type main sequence dwarf, and it has a magnitude of 6.57. Iota Cancri is about 300 light years from our solar system. 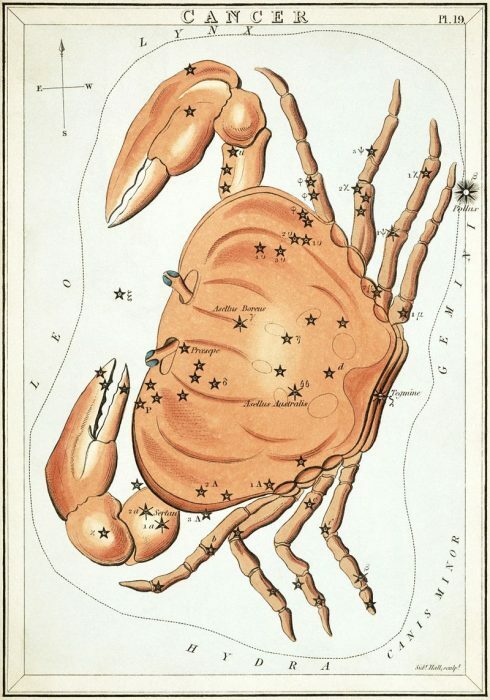 The origin of the constellation Cancer, according to Greek mythology, involves the crab named Karkinos. Karkinos was sent by Hera to interfere in the Twelve Labors of Hercules, a series of tasks Hercules had to carry out as penance. Hera sent the crab to distract Hercules when he fought the Lernaean Hydra, and Hercule was said to have kicked the crab with such force that the crab was shot into the sky, where it became a constellation. Variants of this story include the crab being crushed underfoot by Hercules after it grabbed his toe. In this version, Hera rewarded the crab for its valiant efforts by placing it in the sky. Some Greek scholars believe that the tale of Karkinos the crab was likely a late addition to the Hercules story, an attempt to make Hercules’ Twelve Labors align with the twelve zodiac constellations. Constellations near cancer include Gemini, Lynx, Leo, Leo Minor, Hydra, and Canis Minor. Gemini is found to the west of the constellation of Cancer, and it is another of the 12 constellations of the zodiac. Gemini receives its name from the Latin word for twins, and it is best seen between the latitudes of 90° north to 60° South. It can be seen most easily during the month of February when it is almost directly overhead. Lynx is found to the north of Cancer. Lynx is a fairly large constellation, ranking 28th out of the 88 constellations in terms of size. It is visible between the latitudes of 90° north to 55° south, and best seen during the months month of March. Alpha Lyncis is the brightest star in the Lynx constellation, and it has a visual magnitude of 3.14. 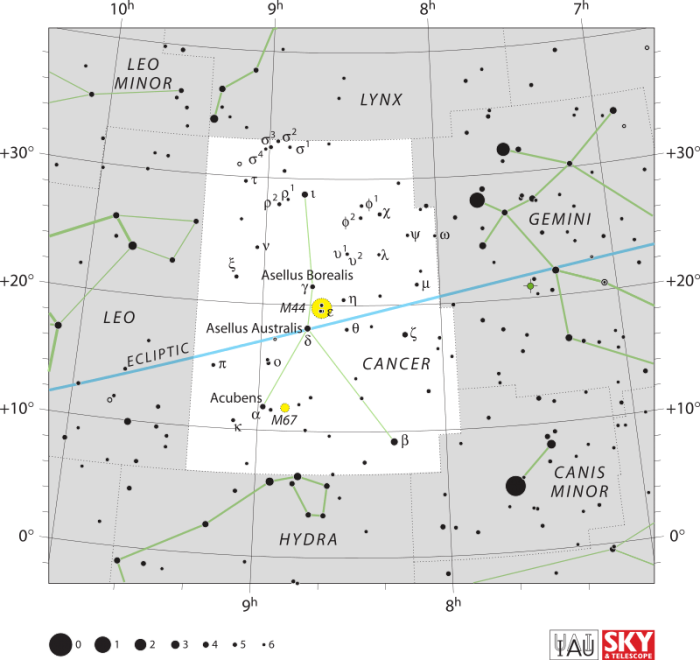 Leo is found to the east of Cancer while Leo Minor is located to the constellation’s Northeast. Leo is another one of the 12 zodiac constellations, getting its name from the Latin word for lion. It is said to represent a Nemean Lion slain by Hercules. Leo the lion is visible between latitudes of 90° north and 65° south, and best seen during the month of April around 9 PM. Many bright stars such as Beta Leonis, Regulus, and Algieba make up the constellation. Leo Minor is a small constellation found just north of Leo itself, and can generally be seen under the same conditions as Leo. 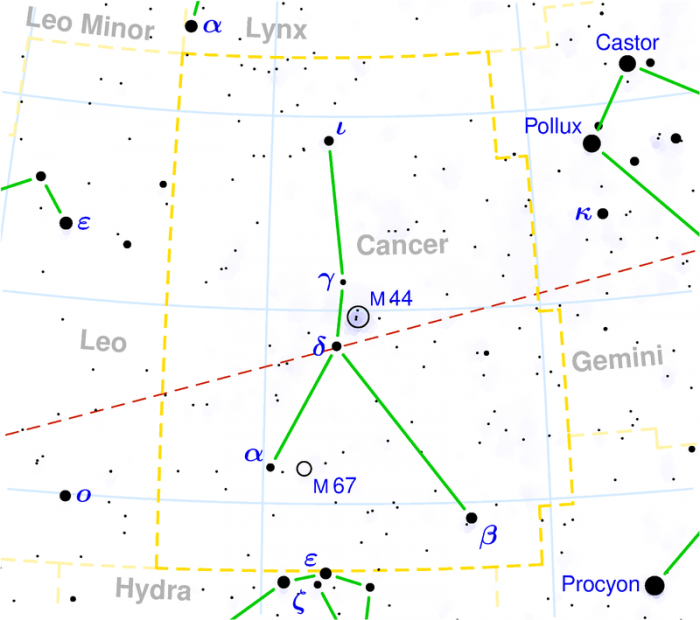 Hydra is found to the south of the constellation of Cancer. The Hydra is the largest out of the 88 constellations found in the sky, and it is also the longest constellation. It covers an area of over 1300 square degrees. The constellation Virgo comes in as second, being just slightly smaller than Hydra. Hydra is best seen during the month of April around 9 PM. It is visible between latitudes of 54° North and 83 tSouth. Hydra’s brightest star is the star Alphard. Canis minor is located to the southwest of Cancer. Canis minor is considered the “lesser dog”, near Canis Major, the “greater dog”. Both of the dog constellations follow Orion the Hunter. Canis Minor is best seen during the month of March and is visible between 90° north and 75° south. Previous Post« Previous What Is An Array In Science?